Sorption of radionuclides (90Sr, 90Y, 137Cs, 152Eu) and nonferrous metals (Cu, Ni, Zn, Pb) from aqueous solutions onto granulated sorbents based on coarsely porous silica gel of KSKG and MSKG grades and on BAU-A activated carbon was studied. The granulated sorbents based on coarsely porous silica gel of KSKG and MSKG grades, modified with Cu, Zn, and Ni ferrocyanides, efficiently take up 90Sr and 90Y from distilled water. In tap water, the sorption efficiency for all the sorbents based on KSKG and MSKG does not exceed 70%. The surface of BAU-A was modified by keeping it in a nitrating atmosphere [NOx-air or HNO3 (vapor)-air] at 90–110°C for 4 h, and also by impregnating it with 10 wt % triethanolamine (TEA), triethylenediamine (TEDA), or urea (CH4N2O). The sorbents based on BAU-A activated carbon efficiently take up 90Y (analog of trivalent actinides and lanthanides) and nonferrous metal ions from various aqueous solutions. Modification of BAU-A decreases its sorption capacity for Cu2+, Ni2+, and Zn2+ but increases its sorption capacity for Pb2+. 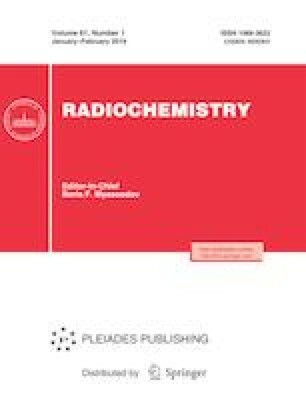 Raschet ravnovesii v analiticheskoi khimii (Calculation of Equilibria in Analytical Chemistry), https://doi.org/www.chemequ.ru, addressed Dec. 12, 2017.